This week was probably the best week I have had here as a PADI instructor and maybe as a diver, full of new things, and wonderful customers. On monday we had the pleasure of diving with Ian and Katie, two lovely people doing their PADI Advanced course, we had a great time diving. Also we got to do Lewis’s final advanced dive and Alan and Steve’s final dive here, it was a fantastic dive, and I am very happy both Lewis and Alan and Steve got to finish on a high. The rest of the week just kept on giving, we started two PADI Open Water referral’s, and it was good watching them getting better and better on every dive. As for what I saw, I found a SEA SNAKE, my first one, which was truly awesome, and some groups of bigger fish that I have yet to name or identify. All in all a great week, and I hope the day’s flow as quickly and smoothly as these one’s have. 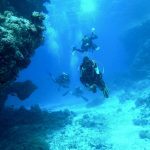 Tagged: PADI Advanced Open Water, PADI Advanced Open Water Tenerife, PADI Open water, PADI Open Water Course, PADI Open Water Tenerife, Sea Snake, Sea Snake Tenerife.